When your spouse died did you have anger mixed in with the grief? If so, that is very normal. One of my clients told me she loved her husband and after over 30 years of marriage they still sat on the couch holding hands. But when he died she felt overwhelming anger. Anger that he had ‘left her’. Anger that she had to do it on her own now. Anger at the life/retirement she had planned and could no longer have. Anger at everything that she now had to deal with on her own. There is no doubt that she loved him and felt great grief, but the anger was even stronger than the grief. As with any emotion, if we push it away (because it feels wrong to have/feel it) it doesn’t get resolved and it stays with us. I always advise people to feel what they feel. In her case, to get his ashes out (she’d hidden them away because of her feelings towards him) and tell him off. To express her feelings. And of course we did EFT on her feelings too. 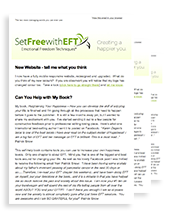 It is EFT that actually allows us to let go of the feelings permanently. The anger is something we often only share with our therapist. Imagine telling your friends that you were angry at the person they knew you loved, who had passed away. They would not get it, unless they had been in that situation. Another client was really angry when her husband had a heart attack, even though he survived. She was angry at the prospect of him leaving in the future (having another heart attack) and felt left in the lurch in many ways, including financial), even though he hadn’t actually ‘left’ yet. That seriously affected their relationship, until she got help and dealt with her feelings. If you are in this situation then please seek help from a professional such as myself to bring you quickly back to peace and happiness. If you are supporting a friend or family member who is grieving, allow them to feel anger as well as grief. Don’t judge them for it. Support them by telling them that you understand how they might feel that way and its okay to be angry. This might be difficult as you may be grieving for the same person, someone you loved deeply. Their anger might seem unfair to you, but try to keep your judgement out of the way. Anger is an easier emotion to deal with than grief, we may unconsciously focus on that feeling as a way of coping. It is only when the anger is allowed, felt, processed and resolved that grief can be fully expressed. What do you ‘spill’ under stress?